Vibrant Colors: With three color choices, you’ll be showing off your style and flair to make or break your look. After all, fashion is essential these days even in technology. 60fps: This is something a number of customers have requested and the frames per second now reach 60 which allow users to have the smooth quality of videos you’ve come to love with all Contour cameras. Instant On-Record Switch: This instant switch makes it easy to record from your favorite moment without having to wait for your camera to load. You simply slide the switch into the locking position and this helps you shoot whenever you’re ready allowing you to never miss a moment. Waterproof: Even without a case, this small package sheds its bulkiness while working underwater even without a case to protect it. Versatility: This is important no matter what type of camera you have. You want something versatile, and the Contour Roam 2 offers it whether your snowboarding, snorkeling, or going on other adventures. You’ll get unlimited angles with this camera giving your camera the ability to mount getting every single shot. Long Battery Life: Having good battery life is important especially for family vacationing trips in the summer. With 3.5 hours of battery life, you’ll be able to benefit from capturing everything. The Instant-On switch eliminates standby mode helping to save your battery as well. Like most helmet cameras these days, the Contour Roam 2 features a rotating lens as well as a built-in laser allowing you to frame perfect shots regardless of where you are or what angle it’s mounted at. For those of you who spend a lot of time in the water, you’ll love the ability of taking your camera with you and capturing life’s beauty under the water. This camera has become in demand by so many consumers, and for those who snorkel, this is going to be the ultimate in capturing underwater creatures. The Contour Roam 2 brings you vibrant color choices and remarkable quality of videos that you’ll come to love for years to come. This top of the line camera continues to improve and has become favored by consumers everywhere. 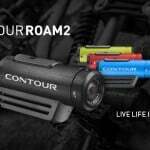 The Contour Roam 2 is very competitively prices just like the original Contour Roam was when it was releases. The regular retail price for this new model is just $188 for the black or $199 if you want one of the colored ones. Very affordable and a great camera for any beginner wanting a HD action camera without breaking the budget. The best deals are always online. You simply can order online and have it arrive at your door a few days later. Amazon.com is the most trusted online shopping store and that’s where the best deals for the Contour Roam 2 can be found. Thanks for reading my Contour Roam 2 review! Have fun with your new camera.